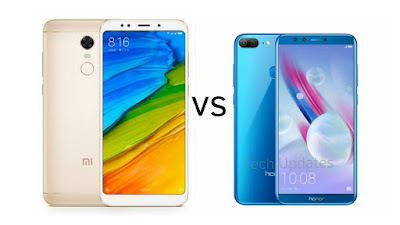 Both Phones comes with 18:9 Full View Display, In terms of Design Xiaomi Redmi Note 5 has Metal body whereas Honor 9 Lite has Glass body. Redmi Note 5 has an Octa-Core Snapdragon 625 Processor compared to Octa-Core Kirin 659 processor on Honor 9 Lite. Both have 3/4 GB RAM and 32/64GB storage options. Honor 9 Lite runs on Android Oreo compared Nougat with MIUI 9 on Redmi Note 5. Honor 9 Lite comes in Sapphire Blue, Glacier Grey & Midnight Black color priced at Rs 10,999 for 3GB RAM + 32GB memory and Rs 14,999 for 4GB RAM + 64GB Storage. Xiaomi Redmi Note 5 comes in Black, Gold, Rose Gold and Lake Blue colors priced at Rs. 9999 for the 3GB RAM with 32GB storage version and the 4GB RAM with 64GB storage version costs Rs. 11,999. Honor 9 Lite offers Dual Front and Rear Camera, Glass body whereas Redmi Note 5 has a bigger battery.